My father manufactured twist ties. Great sheets of steel wire rolled on a conveyor belt, were painted with hot plastic, cooled, then set, and finally sliced toothpick-thin lengthwise, then across. The ties were dumped into cardboard boxes and shipped out according to weight, not content, which always seemed unfair to me. That someone should receive less twist ties than someone else, and randomly, said so much about life. We were put out of business by hand-held twist tie machines, which contained a spool of ties that passed through a cutter operated by a trigger. Ties could be made as long or short as necessary, and spools were inexpensive. We couldn’t convert the production of sheets into spools, and the equipment to refurbish the factory was too expensive. The business went under. Bread makers everywhere owned their own twist tie guns and effectively pulled the trigger on my father’s life’s work. When I was very little he would gift me twist ties, and I would weave them into my hair and twist them under braids. They left light, ghost-white scratches in my palms as they passed from his hands to mine, their edges sharp and unyielding as they cross-hatched to form a multicolor bird’s nest in my cupped hands. The factory fell into disarray at about the same speed as my father, and we finally sold it after he died. I noticed the windows shortly after. New equipment was being moved in and I went to watch the last of my father’s legacy slowly trickle away. The eyes of the factory were composed of a series of large, square windows–four stories-worth of twelve windows that ran lengthwise across the face of the building. Within those sets were twenty-four smaller square windows, making each like the head of a fly. 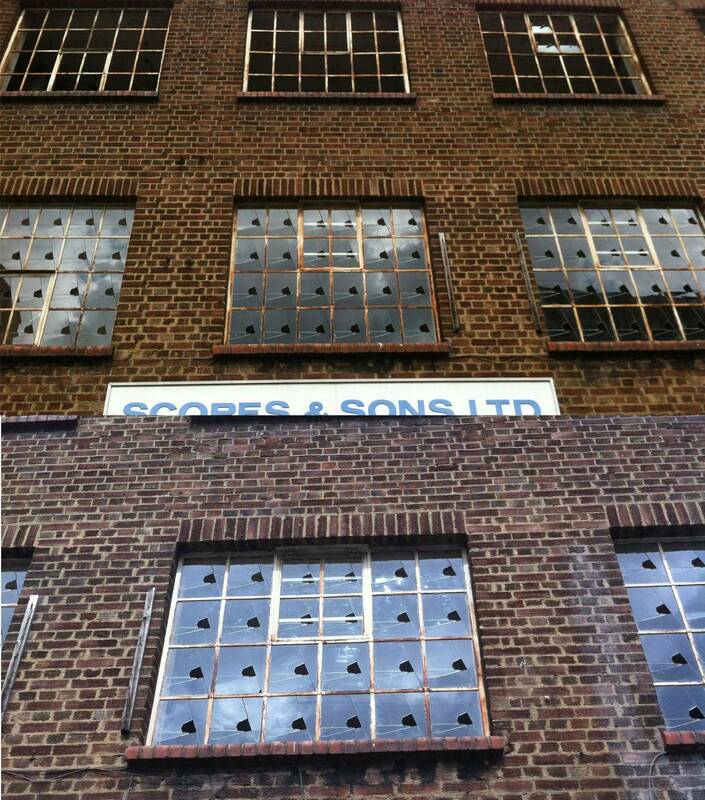 Post-depression era windows, they didn’t open and offered a fractured, distilled light inside the factory. You could almost play a very boring hopscotch game from the light offered by the lowest level of windows, if the time of day was right. The old equipment was moved out and new equipment moved in, and with each day, a single small window inside a set of twenty-four was broken. Holes the size of a baseball appeared in each of the twenty four windows, and each hole was identical, as if the windows themselves had been pushed out of some window-breaking factory and set into the facade overnight. Months passed and the factory became something of an urban legend. The windows were an impossibility; that much was clear. No bored child could have reproduced the same hole in every window. Replacing a window only resulted in the new window being broken, and eventually the owners gave up on replacing them. After three years, there were one thousand, one hundred and fifty-two broken windows on the front of the factory. The owners never opened. A thousand lonely eyes, their pupils sharpened to a singular, repeating point, looked out menacingly on our town. This entry was tagged fiction, flash fiction, microfiction, photo prompt, postaday, story, storytelling, writing. Bookmark the permalink. Good tale–and perfect picture. Nice.